This is subject to change: and this post will be updated if necessary. Please feel free to comment below. Search whole phrase e.g. +"ada di" instead of either +ada or "ada di"
Support for converting .pdb format to .yes format -- Thanks Yohanes Nugroho for the code to read .pdb format! Red Letter support for King James Version (KJV) is now available! The term red letter edition is used to describe Bibles in which words spoken by Jesus, commonly only while he was on the Earth, are printed in red ink. [...] Especially in King James Bibles, this format can be useful as quotation marks are not used. John 3:3 Jesus answered and said unto him, Verily, verily, I say unto thee, Except a man be born again, he cannot see the kingdom of God. 4 Nicodemus saith unto him, How can a man be born when he is old? can he enter the second time into his mother’s womb, and be born? 5 Jesus answered, Verily, verily, I say unto thee, Except a man be born of water and of the Spirit, he cannot enter into the kingdom of God. And here is the screenshot! For the source of which I obtained the red-letter formatting, it is CCEL. I didn't know about ebible at first, so I didn't get it from there, although it seems simpler to parse their formats as opposed to the more complex ThML from CCEL. English version (Quick KJV Bible) will automatically get version 1.4 (no 1.3), and the red lettering is built-in, so there is no problem at all. 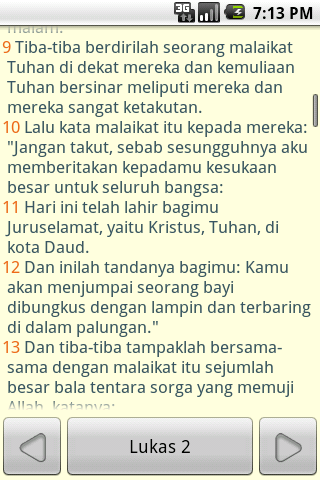 Indonesian version (Alkitab) will still be at 1.3 and the optional KJV add-on will still point to the plain KJV. When this version is updated (1.4. * or 1.5), the download address of KJV add-on will point to the new .yes file which contain the red lettering. However users will need to delete the kjv.yes file in the memory card so that the new KJV with red lettering will be downloaded. Thanks to the suggestions of many people, we can now finally implement color highlights! Now your digital Bible is more colorful than ever! You can choose the highlight (or some Indonesians know it as "stabilo") color from the 6 options. Initially I thought, how can we let the users choose the color, while allowing the users to change both the background and text colors? Won't the highlight be invisible at times, or even worse, be the same color as the text and make the text unreadable? Fortunately, we have a solution here (praise God! I didn't think of it before), which is by using transparency. The highlight color is applied 50% only (50% alpha for geeks). The result is great! See the same screens below when using different color themes. All the text are still greatly readable. Another new feature is whole-word search. I got the idea when I was trying to search Adam in the New Testament, but I got so many "padamu" (on you) and "kepadamu" (onto you). Now you can search for +adam to get the exact-word, the person, Adam. Remember not to put spaces after the plus sign. Also, I would like to thank 10,000 downloaders of the Indonesian version! Thanks for all your encouraging suggestions and comments on the Android Market! Almost together with yesterday's release, KJV version is also released today. The version number is 1.2.2, similar to yesterday's release, with a small change: donation menu and some small enhancements. Currently there are 13k downloads of the KJV version, and I hope to get some support from the users, especially when I don't have a full-time job now. Thanks for all your suggestions and encouragements! Version 1.2.1 of the Indonesian version has just been released! (English version will be coming shortly, maybe after I add a donation button). Scroll thumb is enabled in search result. Acually I have implemented SectionIndexer that displays the book name when scrolling, but I cancelled it because it cannot show more than one character for the section name. Progress dialogs in import/export bookmarks. Furthermore I put the importing into a transaction to make it faster. Some section headings were shifted in Ecclesiastes. History showed something like  3:1 if one navigates using Jump To but doesn't write the book name. Time to release another update! By the way, the download count for Indonesian version is 5168, and for the King James Version is 9333. Thanks to all users for giving ratings and suggestions. Previously, you can click on the big button on the middle bottom to open up the navigation screen where you can select the book name, chapter and verse numbers; or long-click it to open up the dialog where you can type directly the verse address like Luk 7:7. This can be inverted from the Settings. However, I myself seldom use both methods interchangeably. I suppose that the others feel so too, which means to use one preferred method only. Whereas the "history" is missing, nowhere to recall last navigations if you don't bookmark them. So in this release, holding the verse address button shows you the last 10 navigations (from Go to, Jump to, click on bookmarks, and a click on search results). It doesn't look perfect and I'm not sure whether this is useful, so please give some feedbacks. Now quotes are supported on searches! Now you can put quotes between words to search for an exact phrase. For example, searching for "jesus christ" (with quotes) will only return results that contain the word christ after the word jesus. May this help you to search even easier. Other changes include font size scaling for parallel links, performance improvements for book list in the Go To screen, and the ability to copy and share devotion text. 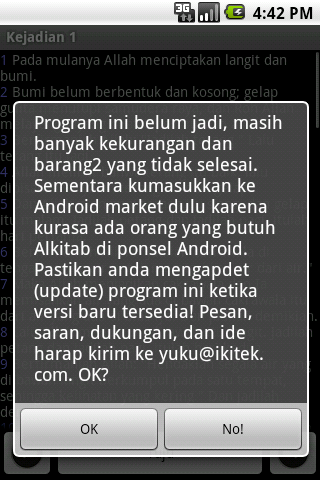 Get it on Android Market! (search for KJV or Alkitab with "Yuku" as the the publisher). Since more than 10 years ago, digital versions of Indonesian Bible text has appeared everywhere on the Internet. Some uses .pdb format (as it was used by Palm Bible reader), some plain text, and some has been processed into HTML format. I actually wondered how did that digital format come into existence, since LAI (Lembaga Alkitab Indonesia, Indonesian Bible Society) does not seem to publish them, nor there is a "transcriber" named for copying the whole Bible book into digital format. For now I can't think of a better way of correcting it besides doing it manually, by using a spell checker (sadly, no spell checker for Indonesian is good enough for this) or -- which we are very thankful -- based on comments that people send. Now, more than 10 corrections have been made to the source text. None of them is significant enough as to change the meaning of the text. Most of them are only truncations of the last few letters as the example above. So, don't worry. Now that we have King James Version text, why not translate the app into English and publish it too, with KJV as the default text? Yes, that's interesting! Although there are many KJV Bible app on Android Market, I believe some people will be more confortable with this app, namely the speed of displaying Bible text which I found is faster than most of the available apps. And also the (hopefully) clean user interface that minimizes distraction when reading the Bible. So, yeah, doing this is not a small task for me. The following was done in order to release the English version of the app. Moving all code base from yuku.alkitab package to yuku.alkitab.base package. This is done such that compiling resources (the R file) into different package does not severely affect import statements on the Java sources. English edition of the app! Actually I didn't get a nice idea how to name the app. 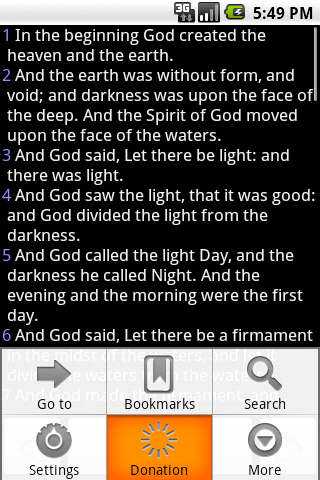 If I just named it "KJV Bible", it will be similar to those other app in the market. Maybe I will emphasize the quickness of the app, so I put "Quick" prefix. If you have some suggestion for the naming, please let me know! And finally, this is the screenshot of the English interface. By the way, this is called version 1.1 and released before the Indonesian release of 1.1 which will have more features enabled. We can only now see Indonesian Terjemahan Baru (New Translation) text. It is very impossible to view other translations like King James or even Bahasa Sehari-hari (Conversational Language) in Indonesian. Many people have requested this, but I had decided that 1.0 will not have this feature. Since 1.0 has been release, it's time to think of this feature. It is not easy to add support for more versions. First we don't want to make the installer size bigger, because most of Android devices in the market do not use Android 2.2 that supports installation to external storage. Hence, the additional versions need to be downloaded separately as add-on, where the data files will be stored on an external storage (SD Card). Actually there are many formats of Bible data, but I could not find one that is well-documented enough (and even, my data format is also not well-documented :p). So, yes, another data format for Bible text. The file ends in .yes (it just sounds nice) and is downloaded from Google's free web/app hosting service, appspot.com. I can be sure that it won't be down so often and I configure the .yes files as static files, so Google will use content distribution system to optimize access speed. For next release, I convert BIS (Bahasa Indonesia Sehari-hari) from bibledatabase.org text and sabda.org section headings and parallels, and King James / KJV text from bibledatabase.org to .yes format and made it available on the main menu of the Bible app. 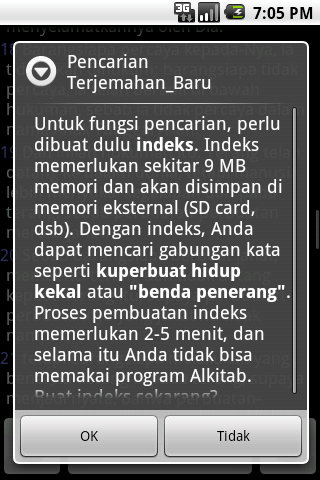 Finally, you see the first English text after so many Indonesian screenshots in this site! All the book names change. When entering the verse address, "Kej" (Kejadian aka Genesis) will not work, but "Gen" will. 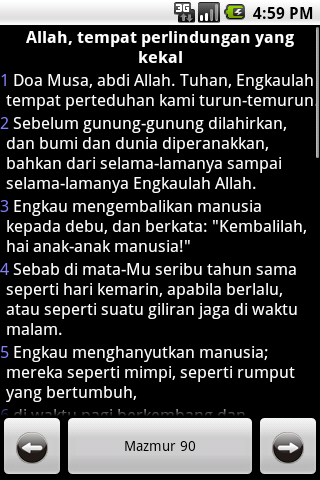 Now, we have an English text, why do we publish only the Indonesian Bible app? Why not translate the app into English and publish it too? Stay tuned! 8 months after the first development, finally 1.0 is released! All the glory is for God alone! Do we need to stick with black background, white text, and blue verse numbers? User feedback says No! Previously there is a setting to change the brightness of the text - the text stays white (or gray), the background is still black. Many requests say they want white background and black text. Rather than satisfying individual request, why not allow us to customize the colors as free as we want? 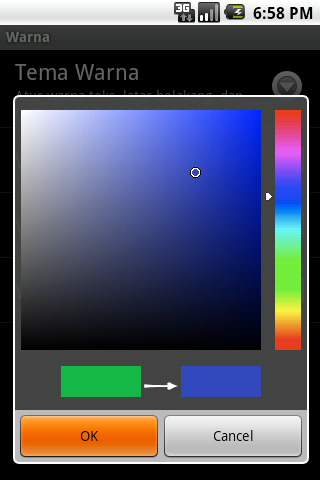 The above select color dialog is inspired by Adobe Photoshop. It was not easy for me to create that, because I need to understand combining gradient paints and converting between color values. I'm thinking of open sourcing this component soon [Update: now available]. But -- isn't it troublesome to select the colors for each of the background, text, and verse numbers? Now we have Color Themes. Instead of selecting the colors one by one, we have presets for users to choose. They have names (in Indonesian), but they're just meaningless really. There is a happy and sad moments recently. Happy because Google has just released Android 2.2, a very cheerful update that speeds up most applications by about 2x. My phone become super fast. Sad because the full-text search powered by SQLite FTS3 does not work anymore. So I think, while the have-to-make-index-first thing is not so good too, it's better to make another search engine that doesn't use SQLite. Instead, the words are searched by scanning the Bible text and finding substrings. If there are multiple words, the subsequent words are looked for from the earlier result. After the following optimizations, it took only 3 seconds to search a word on Nexus One. Instead of calling it for each verse, I call it for each chapter, if something is found, then the verses are identified. Because of number 1, I can use simpler methods to convert upper case letters to lower case just by adding 0x20 to all uppercase letters. The downside of this custom search engine is that it's longer to search (it was < 1 second when using FTS3 engine) and no support for * and quotes. The advantages are no additional space required to store the index, the words need not be exact, and we can filter OT and NT. Up until the previous version, we can only store bookmarks according to the verse we select. No other information is available, nothing we can type and store. Moreover many users ask about the ability to write notes. So in this version we added annotations to write notes and ability to give a title to bookmarks. It is quite complicated to handle old bookmarks. When the program is started, it checks if there are bookmarks in the old version, and converts it to the newer format on startup. Moreover, when there is a bookmark for a verse or there is an annotation assigned to the verse, there will be icons on the right side of the text. If you notice, the arrows for prev/next chapters have also changed. 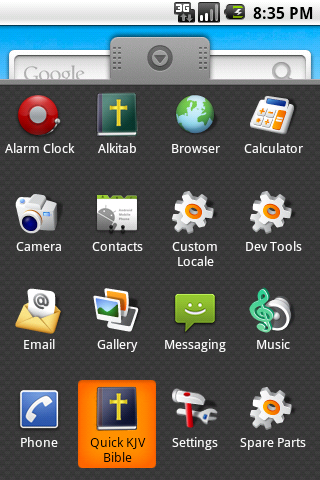 That icon is made with help of Jaya Satrio Hendrick. I hope you like that new, simpler icons. Preparing for 1.0 -- do we have to be always left-aligned? Hmm, let's see, we want to release 1.0, but I feel that something is still need to be polished before 1.0 release. 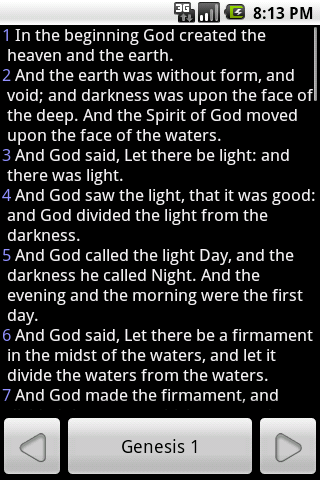 I will show you a portion of Bible text from the latest 0.9 version below. It is taken from Psalms 90. Do you see anything missing? Psalms are supposed to be poetry, nicely written to express similarity, difference, emphasis, and so on. But the display above looks like plain newspaper text with uncertain spacing. It is so... wrong. The bad news is that the indentation data is not readily available. 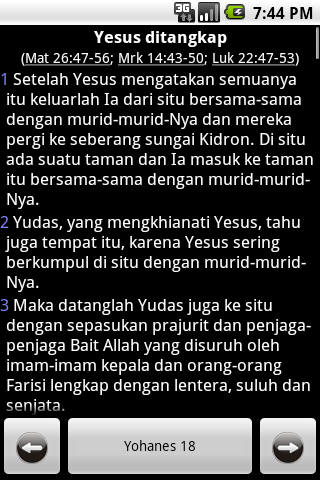 I think we will need to copy it from the Bible book published by Lembaga Alkitab Indonesia (Indonesian Bible Society). Fortunately with help from Roy Krisnadi, the indentation for the whole Psalms book is complete. He sent me a feedback that he would like to help. I said he could help with the indentation data. He agreed and he sent me the data over several days. Thanks! @8 marks the forced new line (at the end of verse 2 above). @@@0Doa Musa, abdi Allah. @8@1Tuhan, Engkaulah tempat perteduhan kami @2turun-temurun. @@@1Engkau mengembalikan manusia kepada debu, @2dan berkata: "Kembalilah, hai anak-anak manusia!" For anyone who wants this data for purposes of developing Bible applications for web, desktop or mobile, you can request it. We have agreed to share this data to others. For version 1.0, only Psalms has this data. We haven't managed to input indentation data onto other books that have indentations. If anyone wants to help, please contact me via the comments section below. One of the most requested feature is the ability to display Devotion (in Indonesian it is called "Renungan" or sometimes bahan saat teduh). So many people requested that so I was very much encouraged to add this feature. This feature is different from other features, in that this requires external support in order to make this work. We need a live web server to handle the request of devotional material, because the material itself changes every day, we cannot store it onto the program. I decided to support two devotional material, which is Renungan Harian (Indonesian version of Our Daily Bread of RBC Ministries), and Santapan Harian (literally: daily nourishment, of Pancar Pijar Alkitab). Renungan Harian is focused on showing how to relate daily events with the Scriptures. The Scripture passage is selected in order to give some message about the daily events. 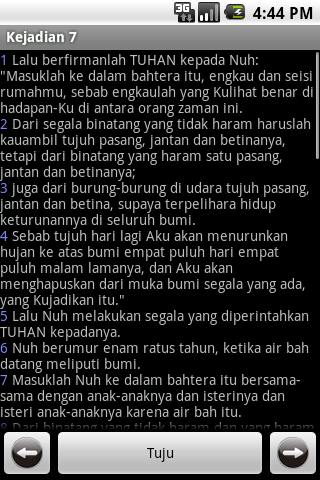 Santapan Harian is focused on giving exposition of every chapter on the Bible, sequentially with jumps every few weeks. After exposition, the implications to our daily life is given. Both can suit readers, although I think the latter is for later stages of Christian spirituality growth. Like the links above indicate, they are provided by my favorite sabda.org website. 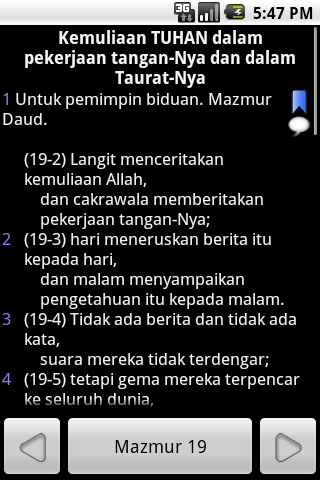 I afraid that if there are more and more users use the Bible app, sabda.org will suffer. So I made some kind of proxy cache in my server at kejut.com. The verse address that is displayed on top of the devotion is clickable to directly jump to the verse. How if there is no Internet connection when one wants to read the devotion? Every time a material is downloaded, it is checked, whether it is valid or not (because sabda.org only has materials until a specific date in the future), then if it is, will be stored into the local database. When the devotion screen is opened, materials up to 14 days to the future will be downloaded and stored. When I read the feedbacks, there are many users that are happy with this, and also quite a number users who had problems... however it's because the proxy cache server is not storing the materials with the correct encoding to the cache database, and it is fixed now! I feel that something is still missing before I can say that the Bible app has a version number of 1.0. What is missing? 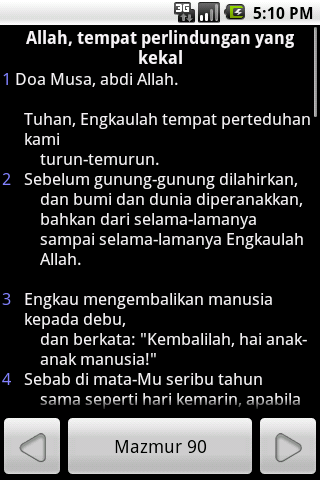 The iPhone app that har made has section headings for the verses (Indonesian: Judul Perikop). So I ask him how to get those data. He said that he got that from a Mac program that shows section headings on Indonesian Bible, and he was able to extract the files as HTML files. However I found some typos in the section headings, in fact I saw several times in a while, so I thought I needed to copy them from my physical Bible book. is converted to: title="Manusia dan taman Eden" address=0x000208 (where 0x00 is the book number (0 is Genesis), 0x02 is chapter number, and 0x08 is verse number). The problem is on the inserting of the section headings into the verse texts. I need a big concentration to write the code to insert them correctly without impacting performance too much. At the end I used two files for the section headings, one is the index where everything will be loaded into memory, and another contains all the texts of the headings. which means the texts in Matthew 1:1-17 is essentially the same story as what is told in Luke 3:23-38. I want to make the parallels appear as links that can be clicked to go directly to the verse. Some fine tuning was applied for the verse address parser to recognize dash sign (which is, if "Mat 26:47-56" is clicked, it will be recognized as "Mat 26:47"). So 0.9 was released (0.9.1 was shortly after released to fix a strange bug), and I am very happy with this, since most of the Bible app don't have section headings and parallels. I hope this app is useful for you, to study God's Word better. Finally, searching introduced in 0.8! A long-awaited feature is coming in 0.8, which is word-searching. By the way, the comments I received via Android Market and via the feedback menu is very encouraging, that allows me to continue developing the app. However, implementing the search function is not an easy task. I wonder how to make it fast enough without introducing a big overhead to the apk (downloaded installer) size. At the end I decided to use the FTS3 (full-text search) that is included in SQLite library which is already built-in to all Android devices. The downside is that I need to create another database for the full-text search to work, and it needs time, too. So when the user clicks on the search menu, there will be a dialog explaining that he needs to create a file on the SD Card for the index. The indexing takes a while, on my Nexus One it takes almost 5 minutes to complete (I got an Android device finally, thanks to Google's developer day where they gave out Nexus One phones). One of the problem I found in 0.6 is that it is very slow to go to different parts of the Bible. You have to select the book from the dropdown menu, type in the chapter number using the on-screen keyboard (or hardware one if you have one), click the verse and type the number again. So in 0.7 I want to release something very useful (at least for me): just type the verse address, something like "1 pet 3:16" or, even better, "1 pe 3 16", "1p3 16", "1p3.16" and other alternatives must also be accepted. So with God's grace I managed to write a quite complicated logic to recognize those patterns. At first I wanted to use regular expressions, but I'm afraid that I will get stuck somewhere. Another feature is bookmarks. You can hold on a verse and a popup menu will be displayed. From there you can add bookmark. When you select menu -> Bookmarks, the following appears. The bookmark stores the verse address, a snippet of the verse, and the date it was last added (since duplicates will update the date stamp). Something big is missing: search! How if I remember some verse about Jesus building church on the rock but I don't remember where it is? I think that's another big thing, but I can't do it for this version. It's too risky. I received many feedbacks from both the program interface and my friends when I see them operating the program. There are several things that I learned. The Go To interface for navigating is too small for fingers! I didn't know this until I really try it on a device. This is the first time I learned that touch screens needed some special handling. So here is the improved version of the Go To screen. The finger now can touch the chapter and verse numbers easily. Then, I changed the text display from a single TextView to ListView items. Surprisingly it is much, much faster to load a new chapter, because only items visible need to be rendered. Almost useless about screen. The number after the version is the internal versionCode. A new thing in this version is the brightness of the text that can be selected on Settings. I used this as the basis. Thanks for sharing the code. Here is the first update to the published Bible application. We don't need the chapter address on the title bar. 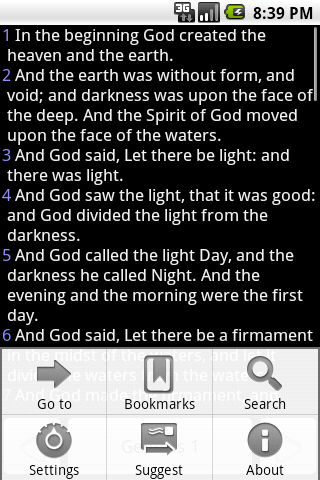 Instead, I moved it to the bottom, to the button that allows you to move to different parts of the Bible. 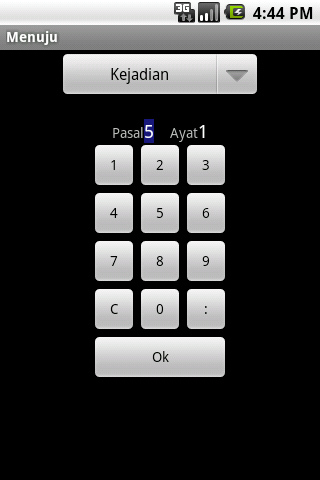 Simple setting screen. You can change the size of font (just a 7-item selection list), the font (serif/sans/monospace) and to bold the font. I really want to get some feedback of the program, hence I popup this message every time the program is opened. I got quite a lot of feedbacks which encourage me to develop it more and more. After some more development as I am more accustomed to Android development, many bugs are fixed, and the Bible software are finally usable and for the public! I need to pay Google USD 25 for publishing, but I think that's acceptable compared to Apple's USD 99 fee for new developers. The slowness of the previous version happens to be the use of java.util.Scanner that reads the information about index of chapters and number of verses of each Bible book. Although the class performs fast on desktops, on Android device without a JIT it suffers a lot. I modified that book information to use binary instead of textual numbers and prevent using java.util.Scanner altogether. The result: book information are read in less than a second, and it is even faster on my friend's HTC Hero. A conclusion: always be reminded that (Android, non-JIT, non-optimized JVM implementation) devices are much slower than desktops. 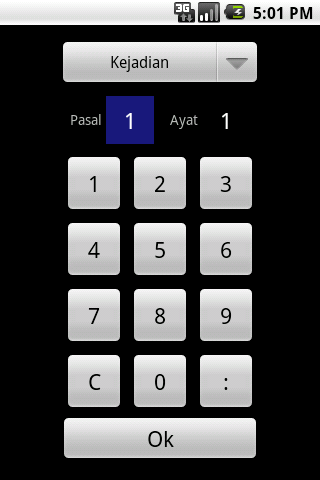 Main interface. It now has a prev/next chapter button on the bottom. Now the Go To screen also has the book selection drop-down. It was painful to select the book and the chapter:verse separately. This program is unfinished, there are many defects and items that are not completed. 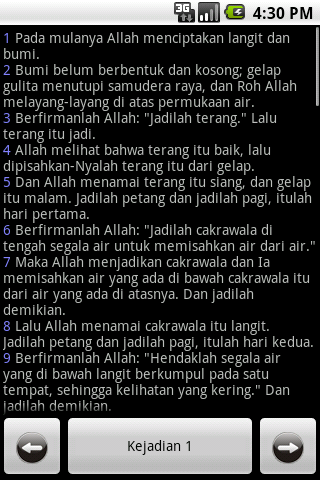 I am putting this into Android market because I think there are people who needs Alkitab (Indonesian Bible) on Android handsets. Please make sure you update this program when a new version is available! Please send messages, suggestions, encouragements, and ideas to (my email). OK? Finally we have some Bible text displayed on screen. The text was taken from bibledatabase.org site, where unformatted (plain-text) Bible data are available for download. The controls are very limited: left and right buttons to change chapters; select menu -> Book to change the book, and select menu -> Go To to change the chapter and verse number. What was interesting about the text display is that it is a single TextView, with some formatting using the setSpan calls on a SpannedStringBuilder object. Actually I wanted to have the verses appear not in a new line every verse, but continually to the right of the previous verse. However, on some chapters, the text entirely disappears! After some frustation, it is that the TextView cannot handle a very long line. Start-up time is very long, why...? It takes about 5 seconds on the emulator (I do not have any Android device). Book selector. The number is the chapters available.